Spirit-Wrestlers Blog: Q76: Correct Spelling of borshch? Q76: Correct Spelling of borshch? What is the correct spelling of borshch; I believe this is the correct spelling, and I am forever trying to convince my fellow Doukhobors there is no 't' on our borshch. Can you please clarify for our Facebook and other readers? Thank you. In Russian and Ukrainian it is spelled one way — борщ. Also in Belarus — боршч. All pronounced the same. No 't' at the end. In English, I use and recommend the phonetic spelling — borshch — to my readers, because it follows the International Phonetic Alphabet (IPA) from Russian to English. For years I have tried to persuade the public to use this spelling. Thank you for asking. The Yiddish German spelling borscht is probably more common due to their huge population in the mid-1800s around New York, where the word likely first appeared in popular print. See Etymology and History. People can be confused when this term is phonetically transcribed to English from different languages — barščiai, barŝĉo, barszcz, borŝĉo, borş, borsch, borščs, borscht, borshch, borsjt, borsht, bortsch ... —; and misspelled — brosch, ... For comparison also see: Q78: How Many Spellings of "Doukhobors"? More confusing to outsiders is the many recipes. There are about 30 types of Ukrainian borsch. In Canada, each Eastern European immigrant group, sub-group, and clan has their own terminology and soup recipes. 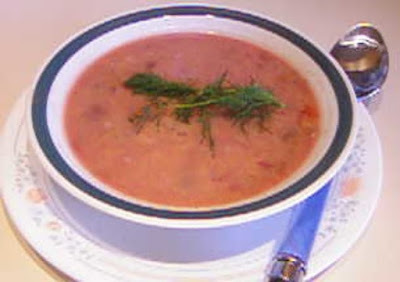 Canadian Doukhobor borshch is a vegetarian soup made of cabbage, potatoes, tomatoes, onions, carrots, beets, dill, peppers, butter, and seasoning. More than 100 recipes can be found on the Internet. Other versions include meat and/or lots of beets. Some add sour cream. Here is my favorite recipe, from my mother Anastasia Tarasoff. Add onion and cook at low heat for 5 minutes. Cook at moderate heat for about 20 minutes. Stir to prevent burning and browning. Add cabbage and continue for short time. Meanwhile, bring salted water to a boil. Add potatoes and carrots, simmer gently ‘til potatoes are cooked. Remove half of the potatoes and mash them. Put mashed potatoes in frying pan. Bring to a gentle boil. Serve hot. * Option: Simmer in butter 1 cup finely shredded beets. Add when you combine mixture before the final boil. Tarasoff, Koozma J. Traditional Doukhobor Folkways: An Ethnographic and Biographic Record of Prescribed Behaviour (1977). See Chapter 6 : Food and Eating Habits, pages 117-156, with 2 recipes for borshch on pages 134-135. Nesteroff, Greg. Canned Doukhobor Borsch?, Castlegar Current, October 25, 2007. Posted on Doukhobor Genealogy Website. l — In 1955, Peter Makonin and Fred Makaroff, Glade, incorporated Kootenay Valley Food Products Ltd, and unsuccessfully tried to sell canned borshch. Today their labels are antiques. When I did translations for Kalmakoff's website he preferred "Dukhobor" to "Doukhobor" - either one has advantages and disadvantages: if people see the spelling "Dukhobor" they might be tempted to pronounce the "u" as "a" in "but"; the spelling with "ou" might tempt at least English speakers to pronounce the "ou" as in English "shout". Since "borshch" is not a proper name, any spelling would be acceptable: "borshch" or "borshtsh" as long as the pronunciation comes out like English "fish-chowder". Why not just keep the spellings "Doukhobor" and "borshch" that seem to be accepted all over Canada including Quebec? Q75: 1899 Doukhoboer Baseball Team?